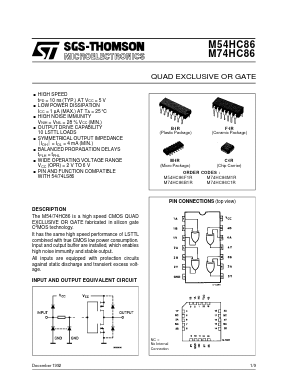 The M54/74HC86 is a high speed CMOS QUAD EXCLUSIVE OR GATE fabricated in silicon gate C2MOS technology. It has the same high speed performance of LSTTL combined with true CMOS low power consumption. Input and output buffer are installed, which enables high noise immunity and stable output. All inputs are equipped with protection circuits against static discharge and transient excess voltage. IW4030B QUAD EXCLUSIVE-OR GATE High-Voltage Silicon-Gate CMOS View Integral Corp.